Jeff ( Lead Investigator) and Chris (EVP Specialist) were visiting St. Clair and noticed the Murphy Inn while driving. For some reason, they both looked at each other and said that they should stop in, have a drink and talk to the owner about any strange activity occurring there. Not knowing of the history of the place, somehow they were drawn to it seemingly by coincidence. Upon entering through the front doors and into the foyer, they both looked at each other and smiled. The place felt 'alive' with energy. It seemed to be 'good energy' and no bad feelings were felt. As they sat in the restaurant, Jeff asked if the owner or manager was in. Pennie, the manager, came out to say hi. Jeff introduced himself and without warning said: "I had this feeling when I walked through the door. Have there been any stories of paranormal activity here?" Pennie turned white as a ghost with an expression of shock and fear. Eyes wide open, she sat down and asked: "Why do you ask?" Jeff repeated that he had a 'feeling'. She then proceeded to tell him the history of the place as well as stories from the staff and guests who've stayed overnight. Jeff contacted Scott (Founder of ParaHaunt ) who went out with Jeff another day to talk to Pennie personally. For safety sake, a quick walk through with infrared video cameras, EMF Meters and Digital Voice Recorders was performed. We only focused on one room, 207. ParaHaunt captured what we believe to be a woman actually walking through the room. The actual shape of a woman was seen as she glided from the window to the closet and then disappeared. There were 15 distinct energy infrared flashes which were not seen in visible light. Among other orb action, one particular orb came out of the bathroom across the room, floated towards the camera getting larger as it approached and then moved to the upper right of the frame. Much more evidence was collected and shown to Pennie, the manager. Through the course of our conversation with her, it was decided that Murphy Inn was too special to keep to ourselves. We decided to create a Public Dinner, Seminar and Investigation Night for 20 lucky people. The date, time and menu were determined and the Event was scheduled. 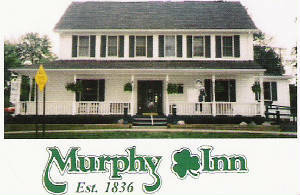 The historic Murphy Inn is located in the scenic river town of St. Clair. Opened in 1836, before Michigan became a state, it stands as one of Michigan's oldest inns. It first started as the Farmers Home, then on to become Scheaffer Inn and finally the Murphy Inn. Always known for its hospitality and comfort. Today the Murphy Inn has all of the modern amenities with an Irish pub complete with dance floor and charming dining room with a fireplace to add warmth and beauty. The seven guest rooms upstairs are finished in antiques and touches of old world charm. Each room is individual but all having private bathrooms. Staying at Murphy Inn will take you back in time. Murphy Inn is a totally restored 1836 boarding house. The remodeling and decor have preserved as much of the original building as possible only modern amenities have been added. The Inn combines history and charm with modern comfort and efficiency. An original Brunswick oak and mahogany bar is the commanding feature of the barroom. Each of the seven guest rooms feature comfortable antiques, pleasant color schemes and private baths. ParaHaunt arrived around 7 PM to get set up in the Main Dining Room. Pennie originally thought the room could only hold 25-30 guests comfortably (at least that is the most she ever had at one time). Hoping that at least 20 people would attend the event, thanks to Chris, ParaHaunt created 30 tickets to be sold at $25.00 per ticket. The plan was to welcome the guests, serve dinner, have ParaHaunt perform it's seminar and then invite the guests to experience an actual Paranormal Investigation (Ghost Hunt) by taking them through the Inn and into a couple 'active' rooms. At around 7:50 PM, 30 guests had already paid the entrance fee and were seated in the dinning room with 4 more waiting to get in. The members of ParaHaunt quickly searched for more tables and chairs. At 8 PM, we had to shut the doors. The staff began turning people away. It was then we decided to have another event the following October. Pennie created a menu with 'spooky' names associated with the dishes which very much added to the evening. After dinner, with the full moon shining in the window and the lights turned down, Jeff began the seminar as to 'who is ParaHaunt' and 'why we are at this location". There was a television turned on in the corner with a DVD player featuring all our best footage of room 207 as taken before. As Scott started to speak to everyone, Chris, Pam and Sean started opening up rooms 205, 206 and 207. Jeff took groups of 5-8 people up at a time. It was decided ahead of time NOT to inform anyone of what ParaHaunt found during our first initial walk through. Each guest gave their opinion of what they 'felt' when they walked through the upstairs and as they entered the rooms. Some guests were so overwhelmed by room 207, they became emotional. There were about 6 groups of guests in all. After everyone had had a chance to experience their "Sensitivity" to the paranormal, we asked them to observe the EMF Meters as well as the television monitor now focused "Live" on room 205. The action was most busy in room 207 so we moved the camera back to that room. It did not disappoint as most of the 30+ guest's eyes were fixated to the set. Everyone enjoyed watching in hopes to capture that one image that would prove the existence of 'ghosts' and 'spirits'. After about 30 minutes of watching the orbs, mists and energy flashes, Scott suggested we move the tables and chairs to form one long table in the center of the dining room. Pennie brought many Vanilla candles and placed them throughout the table. While the infrared camera was fixed on the dinning room, the lights were turned down and the "Circle" began. The "Circle" was very interesting as not many of them ever participated in a séance before. Per usual, Scott began describing what was being presented to him. It didn't take long for one guest to become vocal indicating that he was indeed describing her father who had passed, what he wore, what he did, etc... Some guests were inspired as to say what they felt. Some guests became emotional. All the guests were amazed at the experience. The evening lasted almost till midnight. A poll taken at the end of the night showed all the guests thought the experience was extraordinary and said they would definitely do something like this again. Everyone left the Inn feeling that it was a great night for spirits. ParaHaunt found a few very interesting facts. During the first walk through, the center of the dinning room gave off an electromagnetic field which we were expecting the night of the investigation. It was not to be found anywhere in the room. We searched for wires, light switches, any information about what was above and below the room. This remained one of our biggest mysteries. Also, in the infamous Room 207, during the initial walk through, there were many separate events which caused quite a stir among the ParaHaunt members. We counted 16 separate energy flashes from the infrared video camera that didn't block out the entire frame of video but looked like a flash bulb had gone off creating a photo 'negative' looking aspect to the features in the room (including Chris and Pam who were in the room during the dinner). It looked light bright lightning which took up only a couple frames of video, yet nothing was seen in visible light. The infrared video camera has been used since and did not produce the same flash since. The orb action was plentiful. Although there was no detectable wind current, orbs were moving in all directions, speeds and intensities. One orb in particular (mentioned earlier) was the orb moving from the bathroom. It was the best piece of footage from an orb ever seen from the group. Also, there were two incidences of 'apparition' activity (also mentioned earlier). A woman could be almost clearly seen moving from the window to the closet. Also, there was a not so clear image of someone who moved to the bed and then sat down, eventually laying down. This event took less than 3 seconds. EVP work was performed. Although voices could be heard, ParaHaunt felt that the evidence was contaminated due to the fact that the bar and restaurant was open during the investigation. This was not a controlled area as we would have liked so we had to rule out any data we uncovered. We came back to show Pennie what we did discover and she was amazed. Murphy Inn had never had such a successful evening event before the ParaHaunt Public Investigation. All parties were extremely pleased and another event was scheduled. Please check out "Scheduled Events" page under our "Calendar" for any special Public Investigations ParaHaunt might be having. This was just another one of our experiments to educate and inform the public on the world of the Supernatural.